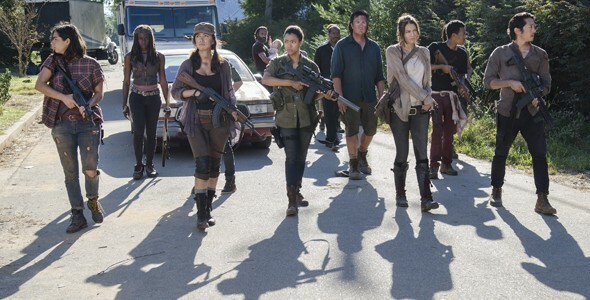 "A Slow, but Strong, Episode"
"Remember" is an interesting episode of The Walking Dead. It certainly fills the role of placeholder, offering us a look at Alexandria without really moving the story forward all that much in the process. Things appear to be in a place of stasis on the outside- there aren't any clear threats, the group isn't looking to travel anywhere, and characters look to be rather content where they are. But the key word there is appear. What "Remember" does so well is allow us to look at the facade of Alexandria while also letting us dive a bit under the surface and see that it's not the paradise Aaron advertised it as. First and foremost, I feel I should say that I think, on the whole, Alexandria is a safe haven. I don't think this is another Woodbury and it's certainly not another Terminus. From what we've seen of her, I think Deanna is a good and fair leader and I don't think she's a power hungry despot with severed walker heads in her bedroom. I think she's trying to govern Alexandria the best she can and she's not above acknowledging when she needs help. I was a bit worried she might side with her idiotic son in the great Aiden-Glenn fight, but I was relieved when she commended Glenn for knocking some sense into him. So, I think that the upper level of Alexandria government is sound and good. But "Remember" showed us that not everyone in the town is of the same cloth as Deanna. Aiden, Deanna's son, is particularly troubling to me. It worries me that she doesn't have a firmer hold over him (although, he is a grown adult, so really, how much influence can she wield). He's hot-headed and rash, and, most importantly, doesn't seem to really understand the threat of walkers. And if one of their runners doesn't understand how dangerous the walkers are, it's safe to say most of the citizens of Alexandria don't understand how dangerous the walkers are. That is a recipe for disaster. Similarly shady is Jessie's husband who only appeared in shadows (never a good sign). He was out late at night apparently drinking (another bad sign). I'm worried there will be some clashes between him and Rick in the future. 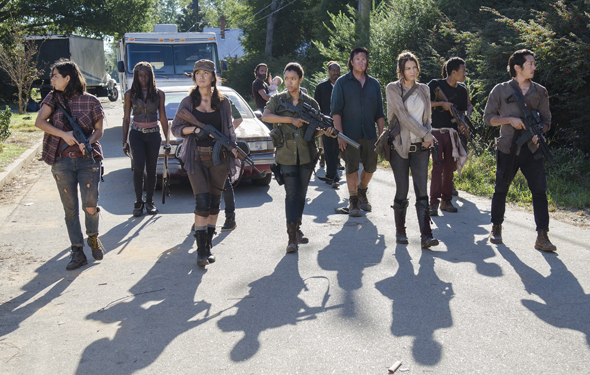 Outside of Alexandria's residents, "Remember" also allowed us to look a bit deeper into how the Grimes Gang is acclimating to life behind walls. It's really like watching a pack of wild dogs trying to adjust to living inside after months outdoors. Some, naturally, adjust way faster than others. Michonne says she's suspicious, but it certainly looks like she's pretty thrilled to be safe and brushing her teeth again (although, I really can't fault her for that- I imagine brushing one's teeth after years without doing so would be amazing). Daryl is, as expected, not buying into the set-up. But Daryl was never really domesticated to begin with. A few nights in Alexandria isn't going to change that. 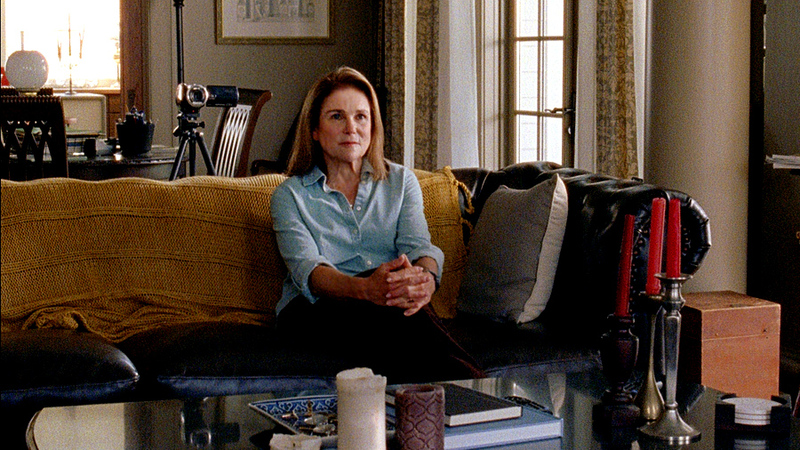 And then there's Carol, who offered bold-faced lies to Deanna about her life before and who she is to the group. We knew Carol was suspicious of Alexandria, but it's clear that she doesn't trust this situation at all, but she's savvy enough to put on a happy face to try and ferret out what might be rotten in the town. I have to say, I'm glad she's taking that stance, and I'm sure there are some unsavory elements lurking under the beautiful facades- even if they aren't as deadly as in past safe havens. There isn't much forward action in "Remember," or even much character development. However, the glimpses we are given into characters, both those from Alexandria and those in the group, hint that friction exists in the idyllic paradise. I anticipate some in the Grimes Gang won't be cutout for life behind safe walls and those who are used to leading might chafe under new leadership. I can't see the Alexandria experiment ending in bloodshed, but as Rick said to Carol and Daryl at the episode's close, the Grimes Gang has the ability to take over should the need arise. And that threat will certainly make things interesting over these final episodes. Final Thoughts -- What's the deal with Enid? Has Carl finally found another kid as well acclimated to this new world as he is? She actually seems to be even better at surviving in the world than Carl is. --Who took Rick's gun? Enid? Someone more sinister? Morgan? -- I love how Rick was all supportive of Alexandria to the group at the end, when he put on the sheriff uniform, but let his real feelings show when he was alone with Carol and Daryl. While Michonne may have emerged as his lieutenant in public, it's clear Rick trusts his real feelings to Carol and Daryl - the group's two skeptics (who likely have the same thoughts as the audience regarding Alexandria). It's an interesting look at the group dynamic. -- There was some serious chemistry between Rick and Michonne this episode. But there was also some interesting chemistry between Rick and Jessie. I'm intrigued to see how that plays out. -- I had forgotten what Andrew Lincoln looked like without a beard. He looks 20 years younger.